I was in the back row of the Holiday Inn ballroom as the VP of sales took the stage to kick off their three day sales meeting. All 120 outside sales reps were asked to introduce themselves and the number of years with the company. I was intrigued so I jotted down everyone’s years of experience. Quickly in my presentation, as I introduced the concept of The Age of Disruption that we find ourselves, I showed where Apple was recruiting 13 – 17 year olds to attend their World Wide Developers Conference. 13 – 17 year olds! To change the world! Amazingly, Apple wasn’t recruiting any of those 3,661 years of experience in that Holiday Inn ballroom. Apple was in search of the new, the innovative … those who see the world differently then those entrenched in the past. 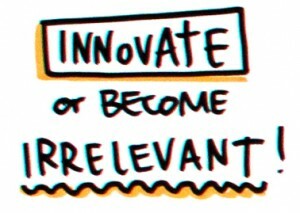 Be thankful for the past, but embrace the future knowing we must innovate or become irrelevant. At your next meeting, rather than asking what are the number of years of experience. Ask, how many years each individual has in front of them in the business. Then focus on what’s ahead … knowing that as the world changes, our markets evolve, our customers demand new experiences and new solutions … we innovate or become irrelevant.